The new Parkrose Farmers Market opens for business at its new location, on NE Halsey Street. 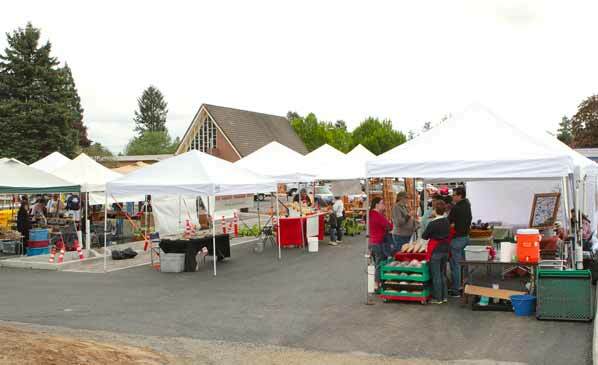 The Parkrose Farmers Market opened its sixth season at a new time, and at a new location too, on May 3. 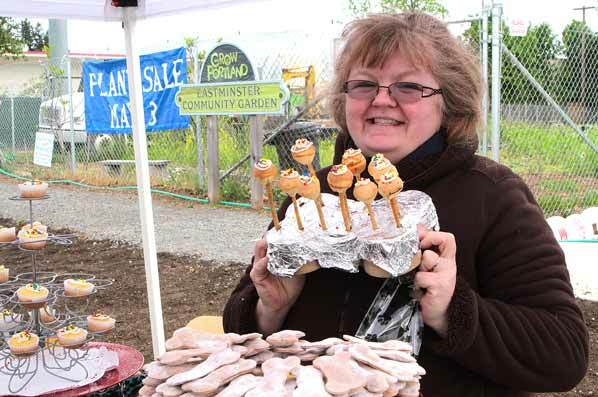 Some 20 canopy-covered stalls were set up in front of the Eastminster Community Garden. 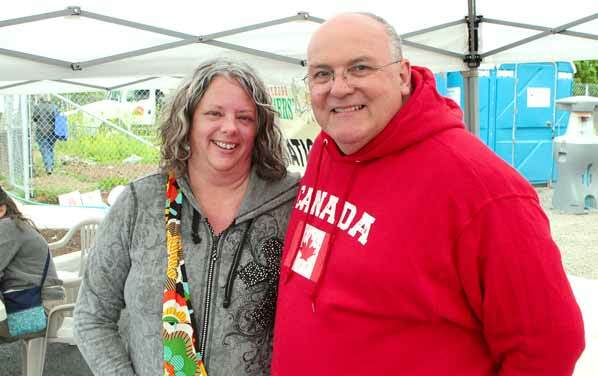 Gusting wind and occasional showers didn’t keep shoppers from visiting the market. Judy Kennedy with Pacific Northwest Federal Credit Union, a market sponsor, talks with new Parkrose Farmers Market Master Ron Glanville. Again this year, the market is participating in SNAP, Oregon Trail, and WIC programs. “We also have a senior donation that allows a person over 65 years of age to double their purchase. We do debit transactions on-site also,” Glanville informed. 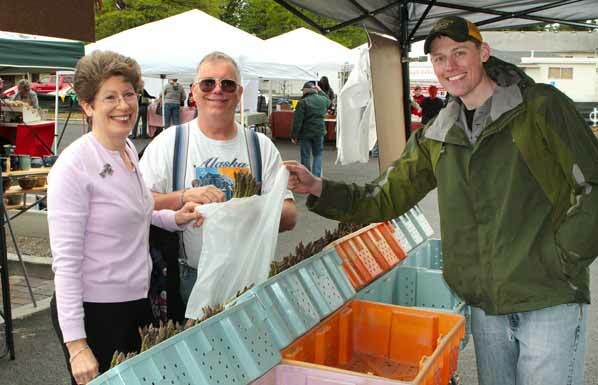 Beth and Milton Sammons buy fresh asparagus from the grower: Nicholas Anderson of Pro Farm Produce. The previous Parkrose Farmers Market, started in outer East Portland in 2008, was located in one of two Parkrose High School parking lots. The new spot for the market is still in mid-County, between the Parkrose Bi-Mart store and the Parkrose Community United Church of Christ – at 12505 NE Halsey Street, a block east of NE 122nd Avenue. Note their new hours: 8:00 a.m. until 1:00 p.m.! If you go after noon, many of the vendors may be sold out, so shop early, Glanville advised. Anne’s Pet Stuff owner Annie Sons shows one of latest pooch treats – PupCakes – doggie lollipops on a rawhide stick. 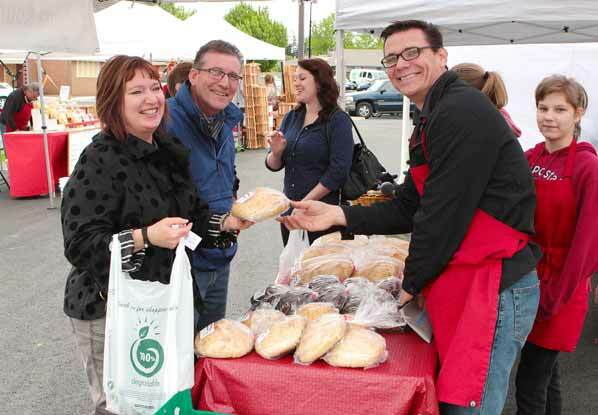 Sandy Van Dorn and Rob Eaton buy a loaf from Eric Wilson of the Kalama Sourdough Bread Co.
To learn more about the new Parkrose Farmers Market, or perhaps become a vendor, check their official website: CLICK HERE. “Check us out and ‘like’ our page on Facebook, too,” Glanville suggested.